MONL invites you to participate in this webinar series which will focus on topics that matter to you. 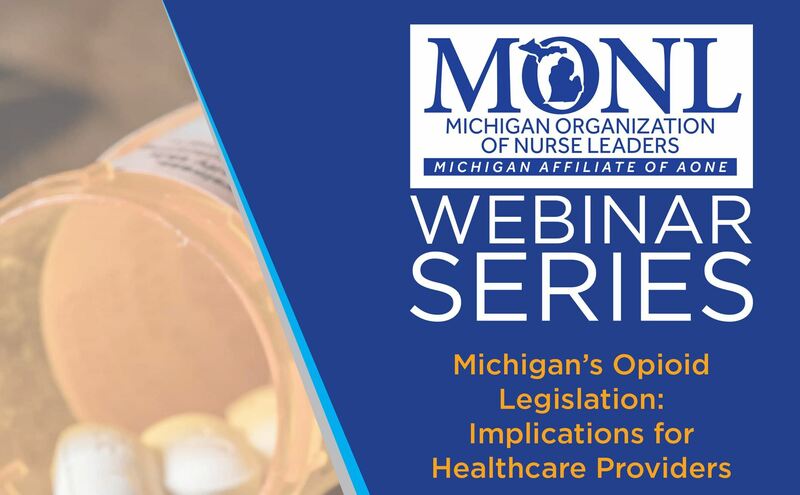 The first webinar will be lead by Paige Fults, Advocacy Director of the Michigan Health & Hospital Association, entitled, Michigan's Opioid Legislation: Implications for Healthcare Providers. This webinar will be conducted via Zoom. 1.0 Nursing Continuing Education will be provided, but is currently pending. Registration cut-off is Friday, August 24 at 5pm. A Zoom link will be sent to you prior to the event with confirmation. All attendees will enter the webinar on mute and will be unmuted at the end of the hour event with Q&A.